or: Apply the brakes, kiddies. One word to sum it up: Mindbending. I admit, cop dramas have never really been my thing. They all seem to think that all cops are bad, and never seem to show the heroism of a cop until the very end when we have lost respect for the cops. Admittedly, I think the only cop drama I have ever liked is The Departed. I never would have watched Brooklyn's Finest had I not had to go through weeks at work seeing it's real cool trailer which was perfectly fit to Rihanna and Jay-Z's hit 'Run this Town'. Despite my reservations about it, I still couldn't help but be a little intrigued by this project by Antoine Fuqua. 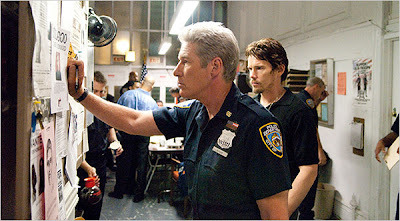 In Brooklyn, amid drug deals, violence, casual racism, poverty, housing projects, and corrupt cops, we follow three officers: Tango (Don Cheadle), African-American, working undercover, believing he's earned a promotion to a desk job but told he has to set up the bust of an ex-con who saved his life; Sal (Ethan Hawke), who'll commit murder to get cash to buy a house big enough for his family; and, Eddie (Richard Gere), the precinct's oldest beat cop, a week to go before retirement, assigned to mentor an earnest rookie. Can this end well for any of the three? Brooklyn's Finest isn't as bad as many critics would lead you to believe. It's genuinely gritty portrayal of the crimeland in Brooklyn may be something that me as a Kiwi simply couldn't believe. The performances, however, really make this movie. Though these characters are those who are often found in these types of films, the actors elevate them to new heights and make the gloriously offensive language-laden script worth the ear battering. Ethan Hawke, especially, knows how to make the audience feel for a character who has done some bad things but is still dedicated to his family. His part is by far my favourite out of the whole movie. That aside, Brooklyn's Finest was really over-cooked. Usually multi-plot movies don't really bother me. But this one had three major seperate stories which I failed to see much connection in. Each story was overlong that the simple explanations that should have been there were replaced by curiously distant melodrama and incessant violence and aggression-fuelled conversations which went way over the top of my head. By the end, it became an all out killing spree and then the dose of heroism came...right on cue. 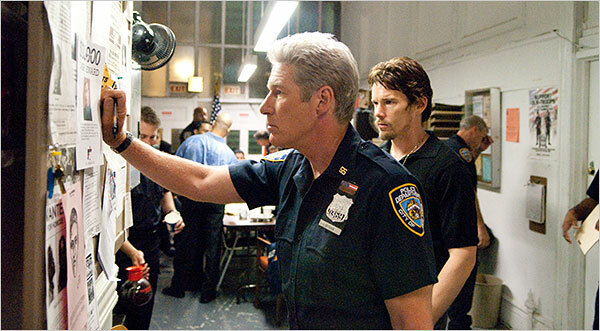 Brooklyn's Finest was clearly confused about where it was going, but then again, when it could get its story straight, this movie really shone. THE VERDICT: Brooklyn's Finest was really good, apart from the fact that it's multi-plot story was a little stereotypical and way too melodramatic. Performances are top rate, though. Don Cheadle was excellent as usual in this.